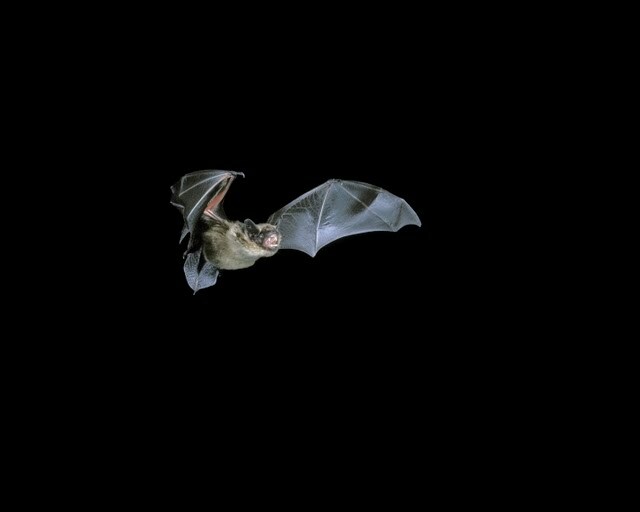 Whilst researching existing approaches to Bat Recognition, we discovered an open source MS Windows program called Bat BioAcoustics – http://sourceforge.net/projects/batbioacoustics/. This analyses a Bat recording and performs call detection to find where in the call there are bat signals, extracts audio features (such as maximum frequency) from the call, and then performs pattern matching (using Support Vector Machines) to categorise the calls to a species level. 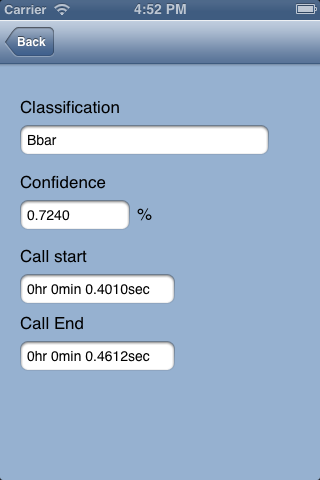 Although we are hoping to ultimately do real-time analysis, this program would be an excellent prototype to test if a phones CPU is fast enough to carry out the calculations. 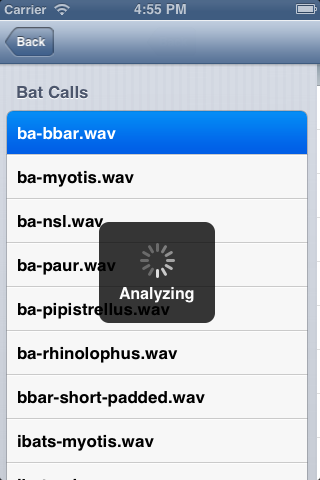 With this in aim, we decided to investigate porting Bat BioAcoustics to an iPhone. BioAcoustics runs as a native MS Windows application, with a graphical interface where users can choose the input files to analyse, and then it writes the results to an output file on disc. We removed from BioAcoustics the sections that controlled the interface, and we then converted the application to run from a command line. Supplying the information it previously obtained from the interface using the command line provided a convenient way to test it still worked without the QT toolkit. Once the other two libraries were replaced, we could replace the command line interface with a native iPhone interface. libsndfile is an open source library that is used to read in various different audio formats, and extract the raw audio. Ultimately audio is just a series of numbers, but storing these literally is very inefficient. Instead they are normally compressed using a variety of different formats. For this project, we’re not interested in the details of how they are stored – we just need the raw audio data from the files – and so libsndfile provides a common set of methods to obtain this raw data without needing to know the details of the file format. Apple provide a similar set of methods in their CoreAudio library, and so we will convert BioAcoustics to use these instead. As long as our wrapper class kept the same methods and parameters, we could swap the classes from using libsndfile to CoreAudio without the rest of BioAcoustics noticing, which is exactly what we did. We wrote a new class that had the same method signatures, but instead of then using libsndfile to read the raw samples from the audio file format, we used iOS CoreAudio, as desribed at Audio on an iPhone. FFTW is an open source Fourier/DSP library. BioAcoustics uses this to perform the low level signal analysis and to extract frequency-series information from the time-series call. Apple provide their own Fourier/DSP library called vDSP, also known as the “Accelerate Framework”. We wrote a new class that kept the same method signatures, but instead of using FFTW to do the low level mathematics, we used the iOS vDSP library as described in Fourier Transforms on an iPhone. Replacing the BioAcoustics wrapper with our own meant that every time BioAcoustics thought it was calling FFTW, we actually used vDSP instead without it realising the difference. Now these three things were in place, we could investigate building our first functioning prototype. Having replaced libsndfile and FFTW with native iOS equivalents, we could run BioAcoustics from the command line on a Mac, using the iPhone simulator. The next step is to write an iPhone user interface for it. Here we can simply pass BioAcoustics the path of the file we would like to analyse, and it will return a list of custom Event objects, containing all the information about each detected call event. This means we can write all our GUI code in Objective-C as normal, we already have the BioAcoustics in C++, and we’ve minimised any potential problems for the interaction between them both. So once this was all done, we had the first functioning prototype! It might not look too great yet, but it’s exciting to be able to test if an iPhone is capable of doing this level of analysis. 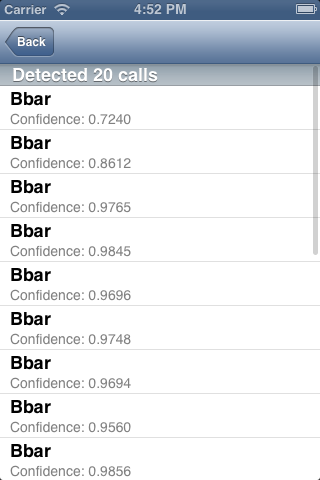 Porting BioAcoustics to an iPhone has been a resounding success! It’s been quite a process but we’ve shown that it is possible to perform the level of audio analysis needed to automatically detect and recognise bat signals from supplied audio. Analysing a 14sec file took 5sec to perform, which also suggests it will be easily possible to run this analysis on a phone in realtime. Because this was a prototype to test the concept, so far we have used a pre-supplied list of call sample files. The next stage will be to implement real time recording and analysis, which will need to use an external time-expansion bat detector. These are pieces of equipment that reduce the frequency of the ultrasonic audio from the bat down to a level that an iPhone is capable of recording. 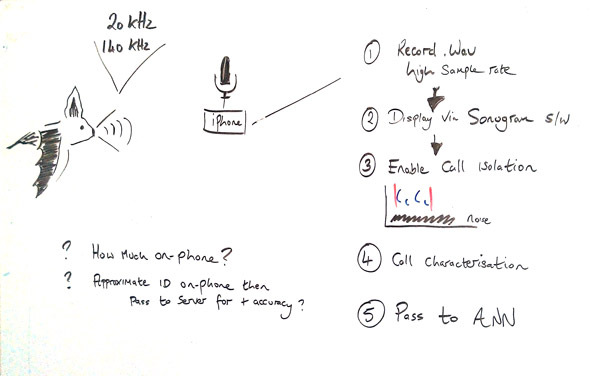 Once the iPhone can record the audio, we can attempt to analyse it in real time. Another useful enhancement would be to display realtime sonograms (spectrograms) on the phone, to aid researchers in their own visual analysis of the signal. Of the four main mobile platforms (Android, iOS, Blackberry and Windows Mobile) we have chosen to target iOS. This was chosen due to the expertise of the developers on the project, and because iOS provides a native programming interface (API) for performing signal processing and linear algebra calculations. Fundamentally, an audio file is simply a long list of numbers specifying the amplitude of a sound wave over time. If you imagine a sound wave moving through the air and hitting the magnet in a microphone, the amplitude is the distance from the origin that the magnet moves. This is an analogue signal. In order for a computer to process it, it needs to be converted to a digital representation. This is called “sampling”, and is a measurement of the position of the microphone taken many times a second. A theorem called the Nyquist sampling theorem states that in order to sample a signal of X Hz without significant loss of quality, you need to sample at 2X the frequency. The limit of human hearing is approximately 20kHz, which hence requires a sample rate of approximately 40Khz. This is why CDs are sampled at 44Khz. i.e. each second of recording in a CD contains 44,000 measurements of the highest possible frequency contained in the recording. A 10x “time expansion” bat detector would record 1sec of audio and play this back over 10sec. For a Pipistrelle this would reduce it’s frequency from about 50kHz to 5Khz, which can be recorded by ordinary equipment with a sample rate of 44.1kHz. Without the time expansion we would require specialist equipment that could sample at 100kHz. 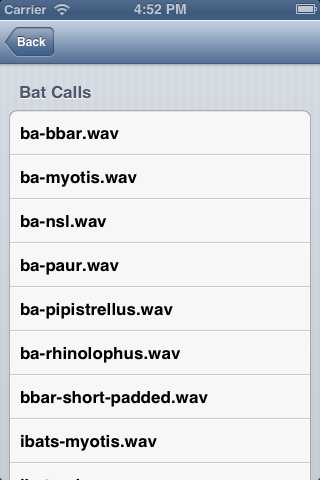 Once we have our recording, we need to identify where within it there are actual bat calls. We have a measurement of audio amplitude against time, which isn’t very easy to analyse. We want to identify where there are certain frequency characteristics within this audio. To convert from a time domain to a frequency domain we need to perform a Fourier transform. Because we have digitally sampled data, we need a discrete Fourier transform, and we will use a quick form of this called a fast Fourier transform (FFT). Apple’s iOS provides a native API for performing FFTs and other linear alegebra. We will be using this to process the time expanded bat calls and detect where within the audio there is a call. The next blog posting will go into this in detail. If I were a betting man I’d wager my house that everyone old enough to tie their shoelaces in this country was a least aware of bats: what they look like and their nocturnal habits. The majority of people probably know about bats because of their close association with the occult and with horror films. Vampire myths form part of the fabric of Western culture. And the added influence of Halloween has reinforced this dark image; that bats are creatures of dread, that drink blood and love nothing more in their spare time than getting tangled in the hair of attractive damsels in distress. 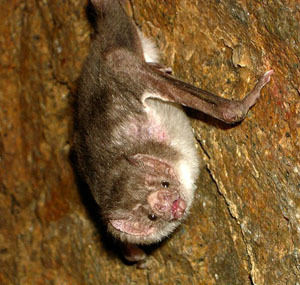 However, of the 1240 or so bat species worldwide, only three New World species, the real vampire bats, actually feed on blood (two species prefer to feed on birds and the other, mammals including cattle and ermm, just ever so occasionally, the odd human). And perhaps at the risk of disappointing you even further, none of them has a propensity for entanglement in hair. No matter how well groomed. Bats are truly distinguished from all other mammals by being capable of true flight. But it’s their extraordinary ability to build an accurate picture of their environment, not by sight but by sound, that puts them in a league apart from other mammals – even others that utilise sonar (namely whales and dolphins). It is this ability to “see” their nocturnal environment using their ears that makes them extraordinarily unlikely to get tangled in your hair. As a result of being fast, small, nocturnal mammals that are practically inaudible to anybody over the age of 30, identifying bats is a tricky business. But if we can listen in to their high-pitched echolocation calls then we stand a much better chance of being able to distinguish them. Traditionally this has been the domain of experts using dedicated bat detectors. Even then, it is not particularly easy to identify bats from their calls. It takes a lot of experience to recognise one bat species from another and most bat detecting equipment has to be tuned into a particular frequency range meaning that you need a least some idea of what you’re listening for in order to find it. However, this project seeks to forever change the way that people eavesdrop on bats. Admittedly, we are aiming for a prototype with this project but we should be able to establish whether or not it is possible to record and automatically identify bats using a normal everyday smartphone. 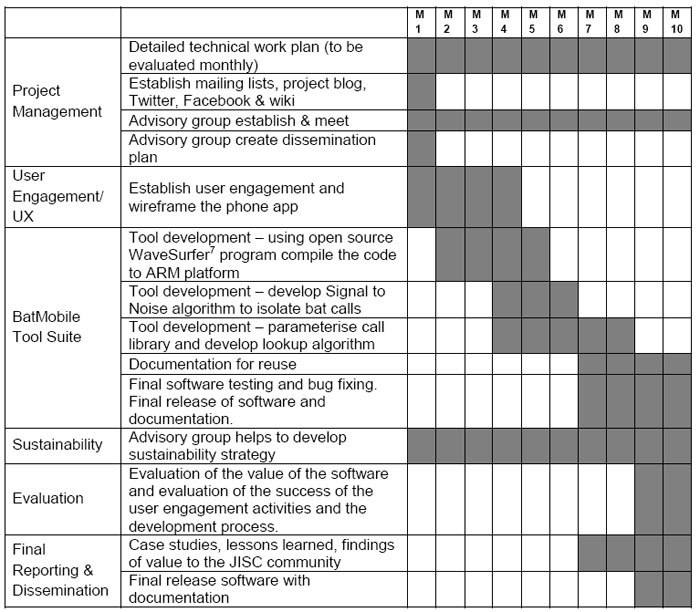 The idea is an exciting one but the project presents some very interesting and tricky challenges. The main purpose of this blog is to disseminate the findings of the project step by step. It’s a chance for us to communicate our successes and also our failures. We’ll be using this blog to communicate what we’ve learned so that others can avoid the same pitfalls when they come to look at similar problems. Hopefully, even to the layperson, this project will provide some interesting results. Bats are no doubt under-recorded almost everywhere they exist and due to their cryptic nature we know relatively little about aspects of their life history including behaviour and population dynamics. Even the distribution of certain species is poorly understood. We hope that the work we do on this project will open the door to helping us understand bats a little better. Welcome to the BatMobile blog. BatMobile is an ambitious project which will attempt to enable us to indentify bats from their ultrasonic calls using a smartphone and an external microphone.